We’d love your help. Let us know what’s wrong with this preview of The Reluctant Empress by Brigitte Hamann. Empress Elisabeth of Austria, known to her family as Sisi, belongs to a famous love story of European royalty. In 1853, the Emperor Franz Josef, the most eligible bachelor in Europe, fell in love with her at first sight when she was fifteen; they were married the next year. On the surface, it was a fairytale marriage, all the more poignant, with hindsight, because her deat Empress Elisabeth of Austria, known to her family as Sisi, belongs to a famous love story of European royalty. In 1853, the Emperor Franz Josef, the most eligible bachelor in Europe, fell in love with her at first sight when she was fifteen; they were married the next year. On the surface, it was a fairytale marriage, all the more poignant, with hindsight, because her death signalled the twilight years of the Habsburg Empire. To ask other readers questions about The Reluctant Empress, please sign up. The best biography of the Empress Elisabeth of Austria that I have so far found, and generally considered to be a definitive work on her. Hamann describes Elisabeth's life from her childhood to her death, and while doing so she definitely breaks away from the romantic fairy-tale images of Elisabeth's life. Hamann shows her as a highly complex and controversial woman - strong-willed, intelligent, independent and highly original, but also self-centred and depressive. Hamann is not afraid to show h The best biography of the Empress Elisabeth of Austria that I have so far found, and generally considered to be a definitive work on her. Hamann describes Elisabeth's life from her childhood to her death, and while doing so she definitely breaks away from the romantic fairy-tale images of Elisabeth's life. Hamann shows her as a highly complex and controversial woman - strong-willed, intelligent, independent and highly original, but also self-centred and depressive. Hamann is not afraid to show her negative sides as well as the positive ones. Many different aspects of Elisabeth's life are brought to light: her relationships to her family members, friends and other people she came across, her travels, her poetry, her physical and emotional health, her role in the affairs of the state, and more. It is heartbreaking to read about the destruction of an attractive and lively personality. Yet that is what Brigitte Hamann’s biography of Empress Elisabeth of Austria does. Titled THE RELUCTANT EMPRESS, Ms. Hamann’s book charts the downfall of Elisabeth (more commonly known by her nickname “Sisi”) from a carefree 15-year-old who caught the heart of the Emperor Franz-Joseph, to a teenager whose children were taken from her by her jealous mother-in-law, to a twenty-two year old who fled the Vienn It is heartbreaking to read about the destruction of an attractive and lively personality. Yet that is what Brigitte Hamann’s biography of Empress Elisabeth of Austria does. Titled THE RELUCTANT EMPRESS, Ms. Hamann’s book charts the downfall of Elisabeth (more commonly known by her nickname “Sisi”) from a carefree 15-year-old who caught the heart of the Emperor Franz-Joseph, to a teenager whose children were taken from her by her jealous mother-in-law, to a twenty-two year old who fled the Viennese court and her marriage because after six years of marriage, she became so ill, that people feared for her life. The very first time i read this biography was in french, and it wasn't until recently, and by one of those rare lucky occasions of being in the right place at the right time, that i purchased the english translation that i now read - just for fun...lol. Anyone with a curiosity about Sissi, be it merely a passing one, or something originating in a visit to Vienna, watching the Romy Schneider movies, or having heard of that ...... called "accidental empress" (and if you read it, ignore it and forge The very first time i read this biography was in french, and it wasn't until recently, and by one of those rare lucky occasions of being in the right place at the right time, that i purchased the english translation that i now read - just for fun...lol. Anyone with a curiosity about Sissi, be it merely a passing one, or something originating in a visit to Vienna, watching the Romy Schneider movies, or having heard of that ...... called "accidental empress" (and if you read it, ignore it and forget it) - This is one of the finest biographies out there on Empress Elisabeth, top 3 no doubt about it. Elisabeth, Duchess in Bavaria, daughter of Duke Max and Duchess Ludovika, was, by a curious twist of fate (she would have called it ironic no doubt), in the right place at the right time - Bad Ischl, in 1853, for the engagement of her older sister Helene to the Emperor of Austria, Franz Joseph. Now fate is admittedly a sneaky mischievous imp sometimes, and in this case, fate would have it that the Emperor indeed fell in love - but with 15 year old Sissi.....oops? (i think even fate may have said it out loud later on when things went downhill). So intense were his feelings that he would have none other for a bride, and never loved another woman for as long as he lived, thus making himself miserable and lonely for a good portion of the years that they were married. Brigitte Hamann does a great job with all sources available at the time she wrote this (1982), and constructs a lively, genuine, and frustratingly sad portrait of a woman so ahead of her time in some ways...and in so much in need of a good therapist in others! Its all here, and its all true, how ill prepared she was for the position since day 1, how the disagreements with her aunt/mother-in-law started very early on and were fueled to the point of "domestic war" partly by lack of communication partly by Sissi's own "imaginary" fears, phobias and paranoias. The many tales about her legendary beauty and her unusual regime, the stories about her passion for Hungary and this country's devotion to their Queen, her endless journeys back and forth over the years to escape Vienna and court life, Hamann brings it all to life in a engaging, well documented, and detailed way - most importantly of all, she clearly presents both sides of the "problem" whenever such is possible, allowing the reader to see her own curiosity/fascination with the Empresss/Queen, but also her own awareness of Sissi's flaws and mistakes. You have no need to resort to any "historical novel/romance" on Sissi, not now not ever, her own life was the stuff of legends as they say....and more than filled with events that will continue for years to come to provide endless discussions about this complex woman who is to this day Austria's most known female historical figure..sorry Empress Maria Theresia...she is. While I liked Brigitte Hamann's The Reluctant Empress, I really didn't like Sisi, Empress of Austria and Queen of Hungary. I found her self-absorbed and entitled, unwilling to fulfill any of her assigned roles, whether it be monarch of a country of mother of a family. She flitted from one expensive indulgence to another, "woe-is-me"-ing all the while. (As a side note, I kept thinking about parallels between Sisi and Diana, Princess of Wales). For some reason I had in my mind that she was influen While I liked Brigitte Hamann's The Reluctant Empress, I really didn't like Sisi, Empress of Austria and Queen of Hungary. I found her self-absorbed and entitled, unwilling to fulfill any of her assigned roles, whether it be monarch of a country of mother of a family. She flitted from one expensive indulgence to another, "woe-is-me"-ing all the while. (As a side note, I kept thinking about parallels between Sisi and Diana, Princess of Wales). For some reason I had in my mind that she was influential in the liberalization of the Austro-Hungarian political machine, but I find that was the case only peripherally. My biggest complaint with Hamann's book is also a critique of my own knowledge gaps. There were many times where I felt she made assumptions about her readers' familiarity with Austrian history that went way beyond general knowledge. For example, she repeatedly referred to the 1848 revolution, yet never clearly set out what it entailed, aspired to, or accomplished. A very useful addition to the book would have been a series of maps of the Germanic principalities and Austrian possessions, showing changing borders and alliances through Sisi and Franz Josef's reign. This would have made so many of the comments that were casually thrown out so much more valuable (unless I'm the only one who doesn't have a clear picture of all this handy in her head). Brigitte Hamann is a renowned historian, all her books are thoroughly researched and written in a style that keeps your attention span. "Elisabeth" gives an in-depth account of the tragic life of the beautiful Austrian Empress. It began with love at first sight, but Elisabeth could not adjust to life at the Court of Vienna with its rigid and stifling Spanish etiquette and a very powerful mother-in-law, the Archduchess Sophie. She saw that the empire was in decline, but her liberal ideas were not Brigitte Hamann is a renowned historian, all her books are thoroughly researched and written in a style that keeps your attention span. account of life of Elizabeth, married to Austrian-Hungarian Emperor , Franz Joseph and mother of Rudolf. Most interesting fact is that her hair was washed every 3 weeks ( it fell to her feet and took 2-3 hours to comb) and how vain she was. I visited the Sissi museum in Vienna in December of last year. It was beautiful and enchanting and piqued my enthusiasm of learning more about Elisabeth. I must apologize, if I sound biased and even condescending, but unfortunately most of the books and research one can find about Elisabeth is only through one author, Brigitte Hamann. Based on everything I have read of hers dealing with Elisabeth I am confused as to her motivations to devote so much time and effort into a subject that appears to I visited the Sissi museum in Vienna in December of last year. It was beautiful and enchanting and piqued my enthusiasm of learning more about Elisabeth. I must apologize, if I sound biased and even condescending, but unfortunately most of the books and research one can find about Elisabeth is only through one author, Brigitte Hamann. Based on everything I have read of hers dealing with Elisabeth I am confused as to her motivations to devote so much time and effort into a subject that appears to not be her passion or even full interest. Dispersed within the texts about Elisabeth she adds comment that have a snide undertone, as if she was more inclined to judge the subject of her research instead of presenting the facts as she has researched them. A 600-page biography, meticulously research and full of facts, has become nothing more than an extended curriculum vitae with Elisabeth being nothing more than a passive entity. The author could have at least tried to bring the person of her research a little more to the foreground to facilitate some interest. It was a tedious read and based on one falsehood I wonder how many other little snippets in this book were stretched further than the truth allowed. Eine der besten Biografien die ich jemals gelesen habe! Hamman provides a great insight on the life of the Empress Elisabeth of Austria. 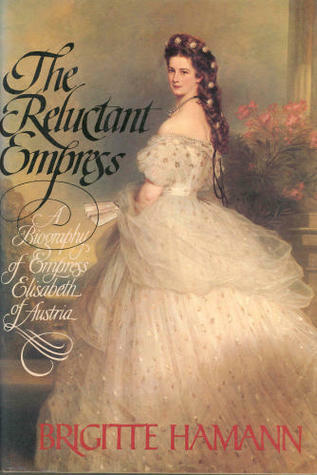 Having read Allison Pataki's Accidental Empress, I wanted to know more about Empress Elizabeth of Austria-Hungary and found this book which is, as far as I can tell, the standard against which other biographies are compared. First published in 1982, it was for me an enjoyable read, delving more into the complexity of Elizabeth (Sisi) and less into the sensationalism caused by her eccentricities and sensitivities. Of Sisi's feelings we know very little, except Having read Allison Pataki's Accidental Empress, I wanted to know more about Empress Elizabeth of Austria-Hungary and found this book which is, as far as I can tell, the standard against which other biographies are compared. First published in 1982, it was for me an enjoyable read, delving more into the complexity of Elizabeth (Sisi) and less into the sensationalism caused by her eccentricities and sensitivities. Of Sisi's feelings we know very little, except that she was very embarrassed, very quiet, and constantly in tears. The seeds of all future conflicts were already sown during these months before the wedding. All had their origin in the discrepancy between a clear-thinking, sensitive woman and her exploitation as a court figure. ...the truth that the marriage of the Emperor and Empress was not harmonious could not be concealed. Their reconciliation at the time of the Hungarian coronation and Valerie's birth remained an isolated episode. Whatever Elizabeth did, Franz Joseph's affection remained unchanged. Franz Joseph statement at the end of her life..."You do not know how much I loved this woman." Lack of experience, excessive sensibility, jealousy of her mother-in-law, the most severe strain on her nerves caused by her husband's long absence--all contributed to her loss of self-control. If true, the Empress would have had to be very ill indeed in November 1860. But according to all the reports from her closest family members, she was hardly that. Rudolph tried to court his mother's attention, imitating her preferences and dislikes. Her lady in waiting wrote ..."It would...be an error...to present the dreadful end of Crown Prince Rudolf as the cause of (her) disorder; it has long existed, and has slowly and steadily been spreading." Statement made by Gisela......"she is not willing to leave the locked gardens of grief she carries within herself." There can be no doubt that the two loved each other; but that their feelings led even once to a definite lapse is according to sources, quite unthinkable--quite aside from the fact that Elisabeth was not a woman who found anything in physical love that seemed worth the effort, and that in any and every situation, Andassy never stopped being the carefully calculating politician. ...Gyula Andrassy was considered to be the Empress's great love. Without a doubt, to the end of his life, he held a special place in Elizabeth's affections. (She) was an excessively sensitive, highly cultured woman given over to fantasy...(She) was tied to a man who was practical and industrious but had no understanding for her complicated emotional life. Elisabeth may be retrospectively diagnosed as a victim of anorexia nervous. Psychologists now believe that this disorder is caused by a deep revulsion against everything that is physical and voluptuous, but most especially against sexuality. “Reluctant” is an understatement. When fifteen-year-old Elisabeth (Sisi) Duchess of Bavaria met her cousin, twenty-three-year-old Franz Joseph, Emperor of Austria, it was as a younger sister of the woman intended for royal marriage. But as fate would have it, the Emperor wasn’t interested in the older sister; rather, he was smitten by the shy, pretty teenager. Marriage was perhaps the last thing young Sisi wanted, not to mention the responsibilities of being an Empress, yet as someone observed: “Reluctant” is an understatement. When fifteen-year-old Elisabeth (Sisi) Duchess of Bavaria met her cousin, twenty-three-year-old Franz Joseph, Emperor of Austria, it was as a younger sister of the woman intended for royal marriage. But as fate would have it, the Emperor wasn’t interested in the older sister; rather, he was smitten by the shy, pretty teenager. Marriage was perhaps the last thing young Sisi wanted, not to mention the responsibilities of being an Empress, yet as someone observed: “One doesn’t turn one’s back on the Emperor of Austria.” The rest is history and, needless to say, they did not live happily ever after. The Reluctant Empress is a well-written, meticulously researched and documented account of a royal marriage gone very wrong. Unprepared and unsuited for the role she was forced to play, Sisi was at first painfully shy and then progressed through eating disorders and starvation diets, fights with her mother-in-law, obsessive bouts of exercise (hiking in the mountains, hunting, gymnastics), fits of depression, compulsive bathing, clothing and hair-dressing rituals, and eccentric wandering, showing up in odd places at odd times to the consternation of her retinue, security guards, and surprised hosts. Sisi read Schopenhauer and Heine and wrote reams of gloomy poetry. She even got an anchor tattooed on her arm to express her love for the sea. She ignored her elder children, doted on her youngest daughter, and avoided her kind, loving, but stolid and unimaginative royal husband. She dabbled in liberal politics with one of her Platonic lovers, Count Andrassy (according to this biography, she preferred admirers and worshippers to physical relationships). She happily left her lonely husband in the care of a mistress. This was a fantastic biography of Empress Elisabeth ('Sisi'). What I liked most was how Hamann chose to organize it thematically rather than chronologically. For example, there was a chapter on Sisi's involvement with Hungarian politics, a chapter on her horse and hunting obsession, and a chapter on (of course) her strange beauty rituals. This unique format wouldn't necessarily work with every biography, but I feel like it was the right choice in this case because Sisi has become such a mytholog This was a fantastic biography of Empress Elisabeth ('Sisi'). What I liked most was how Hamann chose to organize it thematically rather than chronologically. For example, there was a chapter on Sisi's involvement with Hungarian politics, a chapter on her horse and hunting obsession, and a chapter on (of course) her strange beauty rituals. This unique format wouldn't necessarily work with every biography, but I feel like it was the right choice in this case because Sisi has become such a mythologized figure in recent years. The sorting of chapters by subject matter addressed those myths quite effectively. Hamann did incorporate the chronology of broader historical events, though. She also took an unbiased view of Sisi's life and choices, showing that while the Viennese court was a highly structured and unforgiving place, Sisi didn't make things any easier for herself with her frequent withdrawals from court and her refusal to participate in many fundamental traditions. I found the chapter on Sisi's involvement with Hungarian politics especially fascinating--I had no idea her support was so instrumental in bringing about the dual Austro-Hungarian monarchy. When I visited the Schönbrunn Palace in Vienna, Austria, the story of Emperor Franz Joseph and Empress Elisabeth captured me in an instant. Sisi, as Empess Elisabeth is well known in Austria, was famous for her beauty and her antics. A fine horsewoman of her time, she is as rebellious as an Empress could be. She traveled across Europe, rarely joined her husband both at dining table and royal occasion. Her missing at dining table was contributed as well by her obsession to stay beautiful by maint When I visited the Schönbrunn Palace in Vienna, Austria, the story of Emperor Franz Joseph and Empress Elisabeth captured me in an instant. Sisi, as Empess Elisabeth is well known in Austria, was famous for her beauty and her antics. A fine horsewoman of her time, she is as rebellious as an Empress could be. She traveled across Europe, rarely joined her husband both at dining table and royal occasion. Her missing at dining table was contributed as well by her obsession to stay beautiful by maintaining rigorous training and strict diet regime. On marriage, Empress Sisi had her own opinion which surprised me to no end. She said to her daughter Marie Valerie: "Marriage is a nonsensical institution. One is sold off as a fifteen-year-old child, taking an oath that one does not understand, cannot revoke and then regrets for thirty years or more". Did she ever love her husband? Her suggesting him to take a mistress was another sign as well? The Emperor did took a mistress but he never remarried after Sisi murdered. He stayed alone until the end of his days where he said just how much he loved his wife when he was about to leave the world for good. Whilst in Austria in 2007, my daughter bought this 410 (counting index, otherwise 374 ) pages biography of Empress Elisabeth of Austria or popular known as "Sisi" as potraited by Romy Schneider in a sugar sweet way in the 1955 and 1956 movies: "Sissi", and " Sissi- the young empress." Funny enough, last saturday I met an Austrian lady and she did not know about these movies! Having read the biography has left me with mixed up feelings about Elisabeth and Yeaah! I finished it! Having read the biography has left me with mixed up feelings about Elisabeth and her family. On the one hand you admire her, on the other you feel you want to wring her neck. I had no idea about all the wars going on in Europe, as we only usually think of World War 1 and 2. Nor did I know much about the dual monarchy of Austria-Hungary. Lots about politics in the book. Over the whole I did stayed interested enough to finish this biography but keeping in mind this is only one of probably many written of Elisabeth, Empress of Austria. I'd been interested in the life of Sisi for a while, and picked up this book on a visit to Vienna. It's translated from German so something the writing feels a bit odd, but the story is wonderful. It loses a star for the author's sometimes judgmental and unkind comments about her subject, as this loses objectivity. But overall, very much enjoyed. blog post to come. Easily one of the best biographies of Elisabeth of Austria as far as I'm concerned. Hamann doesn't gloss over the fact that she was neither happy, nor easy to live with. She tells it all, in an engaging tone, not without sympathy, but still very much matter-of-fact. Coming from the clichés of the Sisi films, this book presents historical facts and paints an image of the actual living conditions. It is a look into Elisabeth's life and times, but there is little conjecture. Hamann uses letters and Easily one of the best biographies of Elisabeth of Austria as far as I'm concerned. Fantástica lectura llena de anécdotas y curiosidades sobre la vida de esta gran mujer. Wirklich interessante Einblicke in "Sisis" Leben - spannendes Porträt einer faszinierenden Persönlichkeit. The odyssey of a sensitive soul seeking peace. Amazing biography of Elizabeth Empress of Austria and Queen of Hungary. "...German Emperor Wilhelm II: 'she did not sit down, she lowered her body; she did not stand up, she rose...'"
I admit, my knowledge of Sissi before reading this was the myth - the beauty, the spectacle, the ultimate assassination. The Reluctant Empress excels and wonderfully uncovers the difficult, reclusive yet eccentric persona beyond the myth of the Empress stuck somewhere in a different time and place than where she really was for most of her life. Sometimes biographies showcase a certain "...German Emperor Wilhelm II: 'she did not sit down, she lowered her body; she did not stand up, she rose...'"
I admit, my knowledge of Sissi before reading this was the myth - the beauty, the spectacle, the ultimate assassination. The Reluctant Empress excels and wonderfully uncovers the difficult, reclusive yet eccentric persona beyond the myth of the Empress stuck somewhere in a different time and place than where she really was for most of her life. Sometimes biographies showcase a certain soft-spot the biographer has for the person they are trying to represent, interpret and preserve in their book. The tad bit of that in this book just makes it that much more human, but we get the positives, the negatives, the rational and the irrational beautifully presented in well constructed sections. It says a lot that it's been a few decades since the publication of this one and it still stays at the top of recommendations when it comes to biographies of Sissi, partly probably for its incredibly thorough research, which is evident in the sheer abundance of notes and direct quotations, and partly probably due to how Hamann handled the topic - the routes she took in trying to encapsulate someone who never really strove towards being encapsulated. I really, really loved this book. Empress Sisi is one of my favorite historical personalites of all times. I have bought pretty much every single book about her I could lay my hands on and I never miss the chance to visit Schönbrunn or Gödöllő. This being said, I would like to state that I am not an expert on the empress, I am not a historian, I am merely a fan. Ms. Hamann's book is quite extensive and interesting, full with much more information than what you can get from other sources. Also, he I really, really loved this book. Empress Sisi is one of my favorite historical personalites of all times. I have bought pretty much every single book about her I could lay my hands on and I never miss the chance to visit Schönbrunn or Gödöllő. This being said, I would like to state that I am not an expert on the empress, I am not a historian, I am merely a fan. Ms. Hamann's book is quite extensive and interesting, full with much more information than what you can get from other sources. Also, her view about the empress is unapologetic and rather dark. In detail, she portrays a self involved woman who cares only about her own fantasies, and is more than happy to abandon others, be it her siblings, her husband and even her children. The way she is depicted with Rudolph and Gisella is very selfish. She is also portrayed as someone prone to fantasies, but not really so "crazy" as to actually act as if she were in the fantasy, but more like willingly escaping into fantasy and making temper tantrums when she is called upon her duties. The book would have merited five stars, but I've found in the Hungarian edition two unforgivable mistakes. The first is a quote of what she thinks of marriage. The texts makes no sense, and I happen to have heard that very quote countless times in Schönbrunn... correctly quoted. This is on page 35, line 21. The other one is in the end, pages 643 and 647. First it says that Luigi Lucheni stabs her to death on September 10th (page 643), and then that her body (dead body) is delivered to Hofburg on September 5th (page 647). An excellent academic biography of an unusual person who through fate and privilege found herself in an extraordinary situation, as the Empress of the Austrian Empire during its long decline. Although she viewed herself as imprisoned in a gilded cage, her position allowed her to indulge her whims and live in a way she chose. Despite being hurt by the non-acceptance of the Austrian court, she learned to tune out the noise and proceeded to do exactly what she wanted. And exactly what she wanted, t An excellent academic biography of an unusual person who through fate and privilege found herself in an extraordinary situation, as the Empress of the Austrian Empire during its long decline. Although she viewed herself as imprisoned in a gilded cage, her position allowed her to indulge her whims and live in a way she chose. Despite being hurt by the non-acceptance of the Austrian court, she learned to tune out the noise and proceeded to do exactly what she wanted. And exactly what she wanted, though normal for women today, was decidedly not de rigueur in the second half of the 19th century. She was clearly born well before her time. Brigitte Hamann does an excellent job portraying the effects Sissi's non-comfority had on her family, friends, country, and ultimately on the woman herself. The story of Empress Elisabeth, Sissi, is truly tragic as is her shocking death. Elisabetta, ricordata col diminutivo di Sissi, non ebbe la vita luccicante e felice che avrebbe potuto avere se solo si fosse piegata al volere dell’aristocrazia e, sopratutto, a quello della suocera. Sissi non si piegò mai, eppure la sua personalità, così brillante e intrigante, si spense giorno per giorno, anno per anno. Sotto le aspettative del popolo, della monarchia e della famiglia, Sissi soffrì di una malattia per la quale i medici trovavano nomi che non convincevano nessuno. Una malattia che guariva ogni qualvolta l’imperatrice si trovava in presenza di un membro della sua famiglia d’origine, ogni volta che si allontanava dalla suocera e, di conseguenza, dal marito e dai figli.